A US space agency (Nasa) probe has witnessed a moon of Saturn do something very unusual and Earth-like. 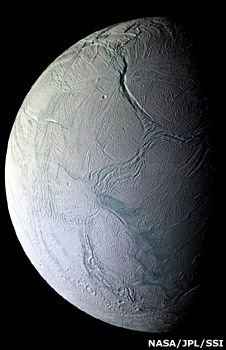 Pictures of the icy satellite Enceladus suggest its surface splits and spreads apart - just like the ocean floor on our planet splits to create new crust. The information was released at a meeting of the American Geophysical Union in San Francisco. The data from the Cassini spacecraft is said to strengthen the idea that Enceladus harbours a sub-surface sea. "Bit by bit, we're accumulating the evidence that there is liquid water on Enceladus," said Carolyn Porco, team leader of the Cassini imaging group and one of the senior scientists on the mission. The observation on Earth that the sea floor is splitting at mid-ocean ridges and moving apart was one of the great scientific discoveries of the 20th Century; and became a key feature in the theory of plate tectonics - the idea that massive slabs of the Earth's surface move around and are recycled. Cassini sees something very similar on Enceladus. The surface of this snow-white moon is riven with cracks - dubbed tiger stripes - at its south pole. Dr Paul Helfenstein from Cornell University used digital maps of this region to reconstruct a history of the stripes, pushing the fractures around on a computer screen until they fitted together like pieces in a puzzle. He found that sections of the cracks had clearly moved from their original locations.